Gray whale (photo by Chris Johnson). Two stocks of gray whales are recognized: the Eastern North Pacific stock along western North America, including Washington, and the critically endangered Western North Pacific stock off eastern Asia (Carretta et al. 2013). Most of the Eastern North Pacific stock spends the summer feeding in the Bering, Chukchi, and Beaufort Seas off Alaska and Siberia (Rice and Wolman 1971, Berzin 1984). About 200 gray whales, known as the Pacific Coast Feeding Group, also summer in waters from southeastern Alaska to northern California (Rice and Wolman 1971, Darling 1984, Rice et al. 1984, Calambokidis et al. 2002, 2010). Recent genetic data suggest that whales in this group are somewhat distinct from the main stock, but that some interbreeding between the two groups occurs (Frasier et al. 2011, Lang et al. 2011). Additionally, at least 12 members of the Western North Pacific stock have been detected visiting waters from off Vancouver Island to Mexico since 2004 (Mate et al. 2011, Weller et al. 2012). Gray whales are a coastal species usually found over the continental shelf. Feeding occurs on the sea bottom in shallow waters. Members of the Eastern North Pacific stock migrate south along the North American coast from Alaska to Baja California from October to January, then resume migration back toward northern feeding areas from mid-February to June (Rice and Wolman 1971, Rice et al. 1981, 1984, Rugh et al. 2001). Wintering occurs primarily along the west coast of Baja California, where shallow lagoons and bays are used for calving in January and February (Rice et al. 1981). In Washington, southbound migration peaks in December, northbound migration is highest first in late March and early April, and again in May through early June when mostly females with calves pass by (Calambokidis et al. 1994). Usually fewer than 20 gray whales visit the inner marine waters of Washington and British Columbia beginning in about January, with some staying until summer (Orca Network 2011). Six to ten of these are Pacific Coast whales that return most years to feeding sites near Whidbey and Camano Islands. The remaining individuals appear unfamiliar with feeding areas, often arrive emaciated, and commonly die of starvation. Whaling depleted the Eastern North Pacific stock to between a few hundred and a few thousand whales by about 1930 (Reilly et al. 1980), but recovery was achieved within 50 years following adequate protection. The most recent minimum population estimate is about 18,000 whales based on data from 2006-2007 (Figure 2; Carretta et al. 2013). Despite high levels of mortality in 1999 and 2000, the population is considered to have fluctuated around its average carrying capacity for the last 30 years (Carretta et al. 2013). Subsistence hunting in Russia, where an average of 123 whales was taken per year from 2006 to 2010, is the largest known source of mortality for the stock. Four gray whales have also been killed by native American hunters in recent years, includin two (one unauthorized) by the Makah tribe in Washington since 1999 and two in Alaska in 1995. Commercial fisheries and various types of entanglements are minor causes of mortality, with a minimum average of three whales killed annually in U.S. waters (Carretta et al. 2013). Reports of deaths from ship strikes average about 1-2 per year although this is likely an underestimate. Another threat to the species is climate change, which is causing a loss of sea ice in some regions of the Arctic. Bluhm and Gradinger (2008) predicted this will increase the pelagic prey of gray whales and decrease benthic prey. Because gray whales feed on both pelagic and benthic prey, they may be more adaptable and fare better than marine mammals that only feed benthically (Moore and Huntington 2008). Reductions in sea ice are also expected to expand oil and gas exploration and shipping in areas used by gray whales, which will intensify the risk of oil spills and ship strikes (Hovelsrud et al. 2008). Ocean acidification will probably affect prey abundance. Monitoring and research. Survey efforts for gray whales are conducted by NOAA Fisheries and partner groups, such as Cascadia Research Collective and the Makah Tribe. Updated stock assessments are regularly derived from survey results and include information on abundance, population trends, and mortality from fisheries, ship strikes, and other sources. Sightings of gray whales in the inner waters of Washington are posted monthly by Orca Network (http://www.orcanetwork.org/sightings/map.html). Research is underway on a number of aspects of the species’ population biology. Makah Tribe’s proposed whale hunt. The Makah Tribe was given the right to hunt gray whales at traditional sites under the Treaty of Neah Bay in 1855. The tribe resumed whaling in 1999, but has since been prevented from doing so by a 2004 court ruling that it must follow the necessary procedures for obtaining authorization to take whales under the Marine Mammal Protection Act (MMPA). The Makah have applied for a waiver from the MMPA regulations. 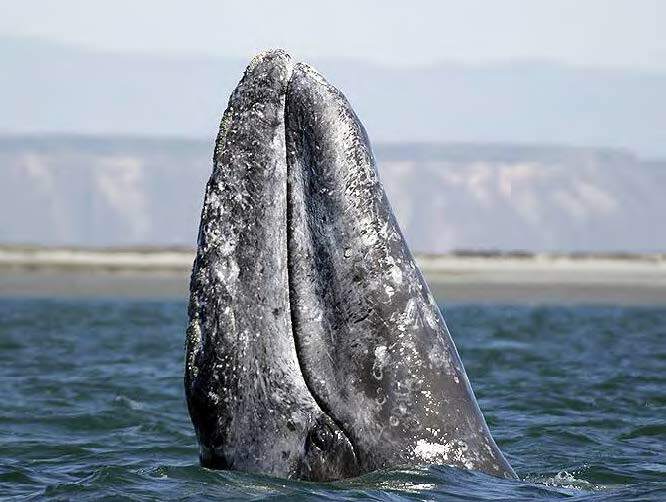 The tribe proposes to harvest up to five gray whales per year and to target only whales migrating through the tribe’s usual and accustomed hunting area off the northwestern end of the Olympic Peninsula. One of the concerns with the hunt is that it may negatively impact the small Pacific Coast Feeding Group population, particularly members regularly occurring off northern Washington and southern Vancouver Island. Similarly, the hunt might result in the take of members of the highly endangered Western North Pacific stock migrating through this same area (IWC 2011a, 2011b). A draft environmental impact statement for the hunt was prepared to meet NEPA requirements in 2008 (NMFS 2008), but review of the document was stopped in May 2012 (NMFS 2012). A new draft environmental impact statement will likely be prepared in 2013 and will incorporate new information on the Pacific Coast Feeding Group and migration patterns in the Western North Pacific stock. Management of entanglements and ship strikes. NOAA Fisheries has expanded its efforts to document entanglements and ship strikes of all large whales in the eastern North Pacific. To better address the problem of entanglements, the agency has held disentanglement training sessions and cached disentanglement equipment at sites in Washington and elsewhere along the U.S. west coast. Stranding responses. NOAA Fisheries Northwest Region coordinates responses to strandings of gray whales through the Northwest Region Marine Mammal Stranding Network, which is comprised of cooperating scientific investigators, institutions, organizations, and state/federal fish and wildlife agencies. Stranding data are entered into a national database. Strandings of gray whales are more common than for any other large whale in Washington and Oregon (Norman et al. 2004), with an average of 4.7 (range of 2 to 11) individuals per year in Washington during the past decade (NOAA Fisheries, unpublished data). 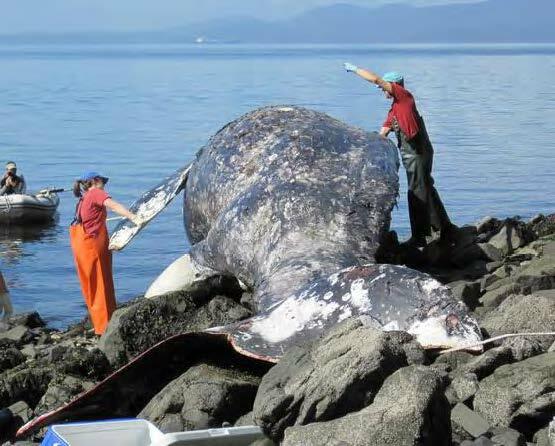 Three strandings of gray whales occurred in Washington in 2012 (NOAA Fisheries, unpublished data). Cascadia Research samples or necropsies many of the stranded individuals to determine cause of death, animal condition, and health. Partners and cooperators: NOAA Fisheries, Cascadia Research Collective, Makah Tribe, Orca Network, Fisheries and Oceans Canada, Dungeness National Wildlife Refuge, Olympic National Park, Olympic Coast National Marine Sanctuary, Port Townsend Marine Science Center, Wolftown, Marine Science and Technology Center at Highline Community College, and local marine mammal stranding networks. Berzin, A. A. 1984. Soviet studies on the distribution and numbers of the gray whale in the Bering and Chukchi Seas from 1968 to 1982. Pages 409-419 in M. L. Jones, S. L. Swartz, and S. Leatherwood, editors. The gray whale, Eschrichtius robustus. Academic Press, Orlando, Florida. Bluhm, B. and R. Gradinger. 2008. Regional variability in food availability for arctic marine mammals. Ecological Applications 18:S77-S96. Calambokidis, J., J. D. Darling, V. Deeke, P. Gearin, M. Gosho, W. Megill, C. M. Tombach, D. Goley, C. Toropova and B. Gisbourne. 2002. Abundance, range and movements of a feeding aggregation of gray whales (Eschrichtius robustus) from California and southeastern Alaska in 1998. Journal of Cetacean Research and Management 4:267-276. Calambokidis, J., J. R. Evenson, G. H. Steiger, and S. J. Jeffries. 1994. Gray whales of Washington state: natural history and photographic catalog. Cascadia Research Collective, Olympia, Washington. Calambokidis, J., J. L. Laake, and A. Klimek. 2010. Abundance and population structure of seasonal gray whales in the Pacific Northwest, 1998-2008. Report SC/62/BRG32 submitted to the International Whaling Commission Scientific Committee. Carretta, J. V., E. Oleson, D. W. Weller, A. R. Lang, K. A. Forney, J. Baker, Brad H., K. Martien, M. M. Muto, M.S. Lowry, J. Barlow, D. Lynch, L. Carswell, R. L. Brownell, Jr., D. K. Mattila, and M. C. Hill. 2013. U.S. Pacific marine mammal stock assessments: 2012. NOAA Technical Memorandum NMFS-SWFSC-504, Southwest Fisheries Science Center, San Diego, California. Darling, J. D. 1984. Gray whales off Vancouver Island, British Columbia. Pages 267-287 in M. L. Jones, S. L. Swartz, and S. Leatherwood, editors. The gray whale, Eschrichtius robustus. Academic Press, Orlando, Florida. Frasier, T. R., S. M. Koroscil, B. N. White, and J. D. Darling. 2011. Assessment of population substructure in relation to summer feeding ground use in the eastern North Pacific gray whale. Endangered Species Research 14:39-48. Hovelsrud, G. K., M. McKenna, and H. P. Huntington. 2008. Marine mammal harvests and other interactions with humans. Ecological Applications 18:S135-S147. IWC (International Whaling Commission). 2011a. Report of the Scientific Committee. Annex E and F. Report of the sub-Committee on bowhead, right and gray whales. Tromso, Norway 30 May-11 June 2011. IWC (International Whaling Commission). 2011b. Report of the 2011 AWMP workshop with a focus on eastern gray whales. Report SC/63/Rep. 2 presented to the International Whaling Commission Scientific Committee. Lang A. R., B. L. Taylor, J. C. Calambokidis, V. L. Pease, A. Klimek, J. Scordino, K. M. Robertson, D. Litovka, V. Burkanov, P. Gearin, J. C. George, and B. Mate. 2011. Assessment of stock structure among gray whales utilizing feeding grounds in the Eastern North Pacific. Report of the International Whaling Commission SC/M11/AWMP4. Mate, B., A. L. Bradford, G. Tsidulko, V. Vertyankin, and V. Ilyashenko. 2011. Late-feeding season movements of a western North Pacific gray whale off Sakhalin Island, Russia and subsequent migration into the Eastern North Pacific. International Whaling Commission Scientific Committee Paper SC/63/BRG23. Moore, S. E. and H. P. Huntington. 2008. Arctic marine mammals and climate change: impacts and resilience. Ecological Applications 18:S157–S165. Moore, S. E., K. M. Wynne, J. C. Kinney, and J. M. Grebmeier. 2007. Gray whale occurrence and forage southeast of Kodiak, Island, Alaska. Marine Mammal Science 23:419–428. NMFS (National Marine Fisheries Service). 2008. Draft environmental impact statement for proposed authorization of the Makah whale hunt. NOAA Fisheries Northwest Region, Seattle, Washington. NMFS (National Marine Fisheries Service). 2012. Notice of intent to terminate the existing draft environmental impact statement and prepare a new environmental impact statement. Federal Register 77(98):29967-29969. Norman, S. A., C. E. Bowlby, M. S. Brancato, J. Calambokidis, D. Duffield, P. J. Gearin, T. A. Gornall, M. E. Gosho, B. Hanson, J. Hodder, S. J. Jeffries, B. Lagerquist, D. M. Lambourn, B. Mate, B. Norberg, R. W. Osborne, J. A. Rash, S. Riemer, and J. Scordino. 2004. Cetacean strandings in Oregon and Washington between 1930 and 2002. Journal of Cetacean Research and Management 6:87-99. Punt, A. E., and P. R. Wade. 2010. Population status of the eastern North Pacific stock of gray whales in 2009. NOAA Technical Memorandum NMFS-AFSC-207, Alaska Fisheries Science Center, Seattle, Washington. Reilly, S. B., D. W. Rice, and A. A. Wolman. 1980. 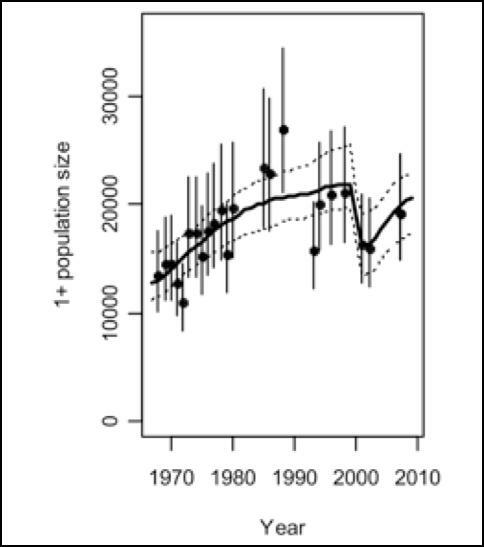 Preliminary population estimate for California gray whales based upon Monterey shore censuses, 1967/68 to 1978/79. Report of the International Whaling Commission 30:359-368. Rice, D. W., and A. A. Wolman. 1971. The life history and ecology of the gray whale, Eschrichtius robustus. American Society of Mammalogy Special Publication 3. Rice, D. W., A. A. Wolman, and H. W. Braham. 1984. The gray whale, Eschrichtius robustus. Marine Fisheries Review 46(4):7-14. Rice, D. W., A. A. Wolman, D. E. Withrow, and L. A. Fleischer. 1981. Gray whales on the winter grounds in Baja California. Report of the International Whaling Commission 31:477-493. Rugh, D. J., K. E. W. Shelden, and A. Schulman-Janiger. 2001. Timing of the southbound migration of gray whales. Journal of Cetacean Research and Management 3:31-39. Weller, D. W., A. Klimek, A. L. Bradford, J. Calambokidis, A. R. Lang, B. Gisborne, A. M. Burdin, W. Szaniszlo, J. Urbán, A. Gómez-Gallardo Unzueta, S. Swartz, and R. L. Brownell, Jr. 2012. Movements of gray whales between the western and eastern North Pacific. Endangered Species Research 18:193-199.